Thank you to the crew for such an interesting and timely session. Thank you for the session, especially the information on ancestors. Truly fascinating. I've always felt some unexplained connection to my grandmother even though I never met her as she passed away very young. It just seemed natural to speak/pray to her when times were rough. I was going through my mental files today trying to find connections with the "ancestor" bit of information and I thought about the fact that the very earliest, Pauline Christians, (the only kind that existed at very earliest times, actually), were all about "filial piety", which was a big thing for Julius Caesar, too (Romans in general). Since all the Christian writings have been messed with or totally fabricated, the best way to get a feel for these people and what they were thinking and doing is to study the archaeology, monuments and so forth. A few years ago I came across a reference to a book in something else I was reading: "Ante-Pacem: Archaeological Evidence of Church Life Before Constantine" by Graydon F. Snyder. Well, of course that really piqued my interest and it turns out to be really bizarre when you compare what the EARLIEST Christians were actually up to, against what we are TOLD. Without getting into a big essay about it, the symbols they were using were: 1) lamb, 2) anchor, 3) vase, 4) dove, 5) boat, 6) olive branch, 7) the Orante, 8) palm, 9) bread, 10) the good shepherd, 11) fish, 12) vine and grapes. In no way were they using symbols of suffering and dying. 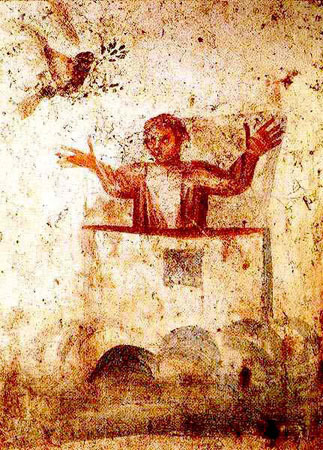 Early Christians had meals with their dead; in fact, the church communities would have meals - like picnics - in the catacombs or graveyards. Apparently, there was no concept of a distant afterlife; that came much later. It's almost like the commandment Paul writes about where Jesus supposedly instituted the Last Supper and said that people should do it "in remembrance of me". Well, maybe that's been altered a bit. Maybe what was really intended was that if you have a meal and commemorate not just Jesus/Caesar, but your loved ones, you can sort of invoke that energy/knowledge. Of course, Paul expected an immediate Eschaton when the dead would all be resurrected for their new life as he conceived it, and I think that his reference to being baptized for the dead meant that people were invoking their deceased family members and being baptized on their behalf so everyone would be ready. Maybe this was a case of Paul seeing things "through a glass darkly", not quite getting the real import? Anyway, one of the favorite symbols of the early Christians appears to have been Jonah and the whale. The term "Orante" refers to a standing female figure with arms stretched above her head. Her head is nearly always covered with a veil, and she wears a tunic of the period. The Orante is not a Biblical figure, she is Greco-Roman. She is the main figure in almost every scene of figurative art as well as being depicted alone more than any other symbol. Frequently she is accompanied by the inscription "pietas" which refers to familial piety and might represent the newly adopted family of the church. On the other hand, it might mean exactly what it suggests: invoking ancestors. There's a lot of nonsense written about it trying to explain it in current belief terms. See: Orans - Wikipedia Some nice representations there, though they picked what they claim is Noah as the top image. For all we know the figure is welcoming the Dove, the symbol of Venus, and Caesar claimed to be descended from Venus!!! So maybe it's Caesar? Anyway, that's the short version. Anybody interested can pick up the book maybe, and try to read/weed through the overlay of modern belief in the interpretations of the figures. Just look at them and try to get inside the heads of the people using them as representations of what they believed. Is this an accurate description of 'brane' in context of the session? The zero-mass states in the open-string particle spectrum for a system of N coincident D-branes yields a set of interacting quantum fields which is exactly a U(N) gauge theory. (The string theory does contain other interactions, but they are only detectable at very high energies.) Gauge theories were not invented starting with bosonic or fermionic strings; they originated from a different area of physics, and have become quite useful in their own right. If nothing else, the relation between D-brane geometry and gauge theory offers a useful pedagogical tool for explaining gauge interactions, even if string theory fails to be the "theory of everything". U(N) gauge theory would be getting Lie groups out of brane geometry. The Cs also mentioned geometric algebra. In an earlier session, Ark mentioned Free algebra and Clifford algebra in relation to the Cs saying algebra sets you "free". Geometric algebra is very Clifford algebra related. Ark and Laura met Tony Smith who was mentioned in this and earlier sessions at a Clifford algebra conference. You kind of want your Lie group physics derived from Clifford algebra information. The infinity/hyperfinite-ness for your Clifford algebra perhaps can in a many-worlds brane state sense go from natural to real to surreal numbers aka quite uncountable as Ark asked about. Being an electrical engineer not a mathematical physicist, I tend to find it easier to think of Clifford algebra in terms of the parallels with cellular automata that Tony Smith has mentioned. I wrote a paper going more into the cellular automata rule space parallels to Tony's model. Thank you for a very rich session. A: That will backfire tragically. Think "Tower of Babel." Yeah, the Psychopathic God is certainly a most interesting read. One could perhaps even argue that the seed of the current collapse started in the Age of Enlightenment, when God was done away with and our society went all materialistic. In a way the head (spiritual) was cut off and people were left bereft with no overall guiding influence and with only a material view of life. The baby was thrown out with the bathwater and life lost its meaning for the most part. Small correction, Jung was Swiss and lived all of his life in Switzerland, though he did go abroad. Interestingly, Lenin (February 1916- February 1917) as well as Einstein (1895 - 1914) lived in Zurich while Jung was also living there. of the matter better and more directly. and returns not quite every two centuries, we find similar conditions. oceans or penetrate into faraway and far different civilizations. people using this term nowadays are unaware of its origin. Running the risk of sounding a bit pop esoteric here: when I attended a workshop I found it curiously strengthening when the therapist chose a number of people (perhaps ten) to represent my ancestors and they were all lined up behind me, each touching the shoulders of the one before them. I also did a workshop by Hellinger 11 years ago and experienced the effect that it had on a person by lining up the ancestors behind the person to give the person strength and support and it was quite a powerful experience. Having done quite a bit of genealogy over the years, I can say it is quite an interesting experience even if I many times have questioned the many countless hours spent doing it. Just recently while cleaning out my mothers flat with my siblings, I was handed some more family archives, so it appears that more research will be needed on a wintry night or two. Q: (Pierre) So you contract a sickness because the soul wants to learn something and experience something, and it's through this sickness that this learning will occur? A: No. The soul and its helpers wants to trigger DNA modification! Q: (L) They're saying no, that it's far more pragmatic. Okay, next question... I'm never going to get to my questions that I have! [laughter] Okay, when you say, "the soul and its helpers", what the heck are the soul's helpers? A: Tribal unit members both in the body and out. Q: (L) So if you're a member of a tribal unit, you are in a way connected via DNA connections or signals or frequencies with your other tribal members, whether they are incarnated or not? Is that what we're saying here? A: Pretty much; no man is an island! Q: (L) So, in a sense, what you're saying is that there is a need for the network to expand as in connecting chakras and so forth which is probably what helps with these “helper” things described a few minutes ago. When people are connected, they can help each other, both in and out of the body to make DNA changes and changes in their whole system. So, that's important. Also, people need to graduate when they get these DNA changes going on in their bodies that are helped by their helpers because of their connecting chakras because the network has strength. Does that make sense, everybody? (L) So, it's very, very important if people want to make this transition to be like the wise virgins: keep the faith, and keep doing, keep putting one foot in front of the other day after day even though they don't see any immediate benefits for themselves. Is that what we're getting to here? Thank you a lot for this new session. the expanding/ancestors/DNA stuff of this session. The part about the ancestors was really interesting and sort of confirms my feeling about genealogy work as being something important that could help us learn a lot about ourselves. In short, it's not just a nice pastime for retired people I had begun some research on my paternal family but I've now hit a wall, due to the difficulty of getting official documents, and the lack of "first hand" information. And the info I do have is just basic stuff - names and dates, professions and places of birth/living. It'd be nice to have some juicy stories. At the very least, when you have places and dates, you can read about the history of the country and the period your ancestors lived in, and it can give you an idea of their way of life. Somehow it makes me think of Herbert's Dune novels (haven't read them but have watched the TV miniseries) where some of the main characters have the genetic memories of all their ancestors living inside of them and they have to learn to deal with it, for fear of losing their sanity. Those who can keep it under control/master it, learn to distinguish between their own self and their ancestors, and keep them from running the show. Those who can't do it become overwhelmed by their ancestors' memories and end up being possessed by them, and eventually lose their identity and sanity. In the end, they become just a tool of whatever ancestor/genetic memory has taken over. Great session! Both with information and humour. I now feel bad since I have little knowledge of my direct ancestors: only grandfather and grandmother. Nothing before them, and neither does my dad remember. At least will try to collect more info about grandparents. When they say that the programming is complete, I understand from the way of people's thoughts and behavings. But, what about their wish for smart cities, more global NWO etc? They still haven't reached that. What I have realised these last couple of days is that I come from a family of survivors. My grand-parents, mother and aunt survived the Japanese concentration camps in Indonesia and my paternal grand-father survived an internment camp which was basically a concentration camp. At one point my maternal grand-mother was also incarcerated by the Japanese, which meant my mother and aunt were on their own (my grand-father was in a different camp). By reading about this particular period of time and by doing some research into my paternal grandfather's past I could release the guilt and the shame that I had felt about the reasons for his internment (which may have been dubious). He most likely had nothing to his name when he was released, but managed to rebuild a life for his wife and child. My maternal grand-father found himself in the same position after moving back to Europe with his family when WW II had ended. I think it is amazing how new information and/or connecting the dots can change one's perspective so drastically. I don't think that feeling the horror is a bad thing in itself, but I find myself reading a lot of stuff on the subject and tweeting exposing news about these sickos quite often, trying to make a difference. Perhaps I should take a step back and look at this more calmly, but it's hard especially when you have kids of your own. In this instance, I'd say do what feels right to you. You'll know when you've crossed the line into obsession. Thanks for the session. Very interesting! Not sure if that's what you mean, but I have a similar impression. It's becoming more and more obvious how politicians, especially head of state ones, are just actors and a surface for the public to project on (At least for smaller countries like in the EU. It might be different for Trump and Putin). I also have the impression that the global trend / development goes towards cooperation and stabilization, like a crystalizing wave around the planet (you know these cooling packs that you click and they crystalize?). PTB in the background get crazy if nobody is interested in clash of civilizations. And once countries have strengthen their dependency on each other in a positive way and trust has been established, also between the people of different nations, then it's much harder to get anybody back to even consider war. Pretty much. Like herding people to a finer order of control. That seems to have been completed with so many people in a state of severe confluence over the 'right/left' thing and distracted and discombobulated over "social justice". There's a sense that no one is in control, no one, at least on this planet, is driving the bus, hence the sense that the ptb are pretty much useless at this point, or they just serve to make matters worse. They're irrelevant really in terms of the trajectory that humanity seems to be on. Thank you for the session and the transcript, everyone! This session is huge! Wow... Definitely going to have to get read over and over. I've been wanting to have my DNA analyzed due to my not having ever met or seen my father, of whom I've heard about to no end, but never seen. Does anyone here recommend a different group for DNA analysis? Merci beaucoup pour la session. Bonne nouvelle, il semble que le spectacle va enfin commencer. Merci pour la perspective d'Ark sur la gravité. L'information gravitaire est-elle seule ou l'information et sa pratique? Ou la pratique n'est-elle qu'un niveau de gravité plus élevé? There may be some leads on Facebook and Tweeter. Good luck with your quest. Thanks... I've been farting around google already but I was hoping for recommendations local to this forum's user base who have experience with the whole thing... I've followed that Fbook group for now. Reactions: PERLOU, loreta and c.a.